Well, you can file this one under cards that I probably won't be able to get autographed. But, in case Pac is alive and planning the greatest comeback ever I've got a card for custom card for him to sign. 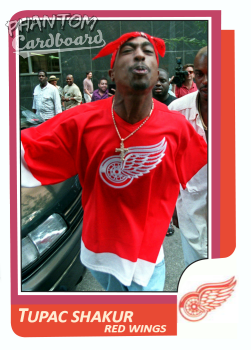 This is one of the more famous images on Tupac and practically begging to be a card. This one is inspired by the 1986 Topps hockey set. This is the second time (Cameron Frye) I've used this design, and also the second Red Wing.